To view the source site for this and more news articles on Micajah Clark Dyer, click here. You shouldn’t discount the truth of old legends that get passed down, as I recently discovered afresh. Sometimes, evidence to support a folk tale can pop up at a time and place you least expect. That’s the way it happened with this legend. 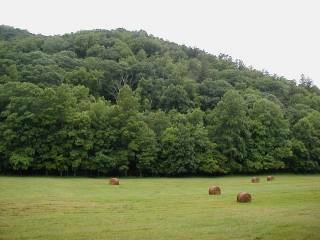 Upon retiring, I moved back to Blairsville, Ga. to live on the old home place where I was born in the Choestoe District of Union County. 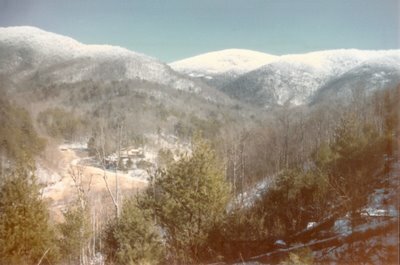 Here the mountains rise tall and the crystal clear creeks sing peaceful melodies as they wend their way toward the sea. The property is isolated from the rest of the community, and the only manmade sounds come from the occasional whir of an airplane as it travels across the sky or the rumble of a visitor’s auto coming up the road that ends at my house. It is the kind of place that welcomes you to dream impossible dreams. And certainly the legend that came down through my family about the dream that filled the mind of my great-great grandfather, Micajah Clark Dyer, seemed at the time to be impossible. He lived here, right at the foot of Rattlesnake Mountain where I now live. He was a uniquely intelligent man and built a gristmill on Stink Creek where he ground his and the neighbors’ corn. He hollowed out logs and piped water into his house, giving him the distinction of being the only resident in the community to have running water. He was always working on some new technique or invention in the shop in back of his house. Some of his neighbors thought he was a kook to spend so much time tinkering on gadgets that didn’t seem to them to be worth anything. Their unkind remarks caused him to become very secretive about his creations, and he kept his shop locked, shielding his work from their prying eyes. His impossible dream began in the mid-1800's when he was just a young man in his twenties with a growing family to support. As he watched the birds flying over his farm he wondered, why can’t a man fly? His education had not advanced beyond the little one-room school in his community. He was a poor farmer, with only primitive tools for building things. Yet, we all knew from the story that had been handed down for more than a hundred years that he designed, built and flew a crude airplane right off the side of Rattlesnake Mountain. According to legend, the family and neighbors actually saw him navigate the craft over his fields. 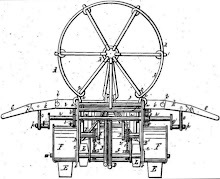 He reportedly applied for a patent for the machine, and it was believed that after his death in 1891 his widow sold both the contraption and the plans to some brothers named Redwine. The family still firmly believes that those items eventually wound up in the hands of the Wright brothers, who were credited with making the first manned flight in 1903. It was another dozen years before I started to realize the need for keeping the legend of Clark Dyer’s invention alive for future generations. This led to my writing and publishing The Legend of Clark Dyer’s Remarkable Flying Machine in 1994. I included everything we knew about the invention and what we had heard about its outcome. By the time I finished the book, I had reconciled myself to the sad reality that my family and I would never have any documentary proof that my great-great grandfather built and flew an airplane here in the North Georgia Mountains almost 30 years before the Wright Brothers flew theirs. He said a young man named Joey, one of Clark Dyer’s descendants, had typed in “Micajah Clark Dyer patent” on Google, followed the links, and succeeded in accessing the patent in the U. S. Patent Office files. Sure enough, when I got home I was able to perform the same search and get to the Patent Office where, for the first time, I was able to see Patent No. 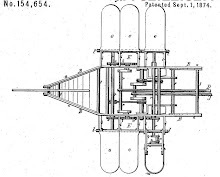 154,654 issued to Micajah Clark Dyer of Blairsville, Ga. on September 1, 1874, for an “Apparatus for Navigating the Air.” The drawings and specifications looked like something an engineering PhD. had drawn up! The aeronautical principles he had addressed were way ahead of anything that others trying to invent a flying machine had yet envisioned. I now had proof that the legend was fact. Clark Dyer really was a genius who had designed a craft that included new and innovative methods for navigating the air. He had done this despite living here in these remote mountains, without any formal education, without any sophisticated tools, and with only basic materials. Later, we found two newspaper stories that were published in 1875 about the invention, one in the Gainesville (Ga.) Eagle and the other in the St. Louis Globe-Democrat. But, obviously, there was not enough publicity to cause Clark Dyer to be included in the history books. I knew we had to get public recognition for this man’s accomplishments. He was very deserving of honor for his work, even though it was long past due. I was determined to do whatever I could to see that he would get credit now. I decided to write our State Representative, Charles Jenkins, and ask him if he would introduce legislation to name State Highway 180 from the junction of U.S. Highway 19/129 to the Brasstown Bald Mountain Spur the “Micajah Clark Dyer Parkway.” Mr. Jenkins responded favorably and enthusiastically, saying he agreed that the evidence I sent him fully supported giving Clark Dyer this honor. He introduced the resolution during the legislative session of the Georgia General Assembly. The House and Senate ultimately passed it unanimously, and the Governor signed it on April 28, 2006. On July 15, 2006, the road sign was unveiled at a well-attended ceremony, and now everyone who drives along this popular road gets the opportunity to recognize a pioneer aviator who had to wait 132 years for “his day” to come. Next time you hear a legend that sounds far-fetched, don’t dismiss it too fast as only an idle tale. When you least expect it, evidence may pop up and prove it to be true!